IES, Inc. creates high quality structural design software for engineering and related professionals. Your solution for general analysis, frames, trusses, shear wall systems, foundations, retaining walls, floor systems and more in steel, wood, concrete, aluminum, cold-formed, and masonry. Gravity Retaining Walls (ACI Chapter 22 provisions). Restrained Walls (e.g. Basement Wall, propped cantilever). Wall stems may be concrete or masonry (or mixed). Wall stems may be tapered (battered) or stepped. Design Checks according to IBC 2009, ACI 318-08, or MSJC 2008. Wide variety of loading types. QuickFooting. Concrete spread footing (single column pad), imports from VisualAnalysis. Design and check reinforced concrete footings under a single column without building a complex analysis model of the building. Advanced handling of biaxial loading. Offset pedestal from footing center. QuickMasonry is a stand alone tool of masonry components to manage multiple structural components within a single project file. 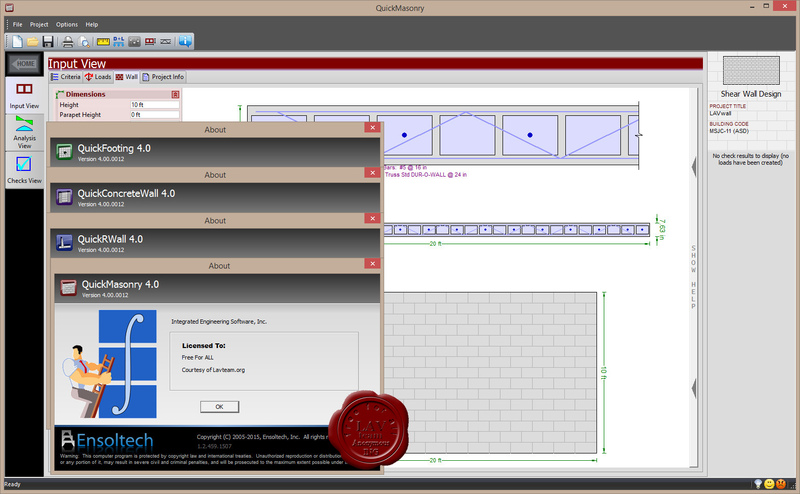 The QuickMasonry "Project Management" tool offers the ability to design a whole series of lintels and walls, for a single building in one project file, following the latest masonry design specifications and offering a host of impressive features. 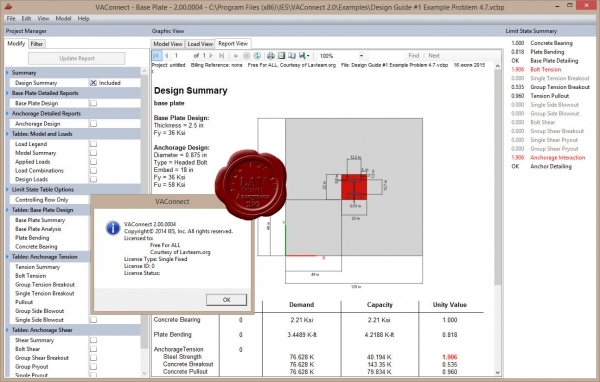 Quick Masonry has been specially designed to display every calculation performed along with any associated diagrams. This complete exposure of calculations is unmatched in the industry and allows the peace of mind that comes from personally viewing and verifying any calculation about which there may be a question. Panel Walls (loads out of plane). MSJC-2008 or MSJC-05 Code Provisions (ACI 530, ASCE 5, TMS 402, ASCE 6, TMS 602). ASD (Allowable Stress Design) both MSJC-2008 and MSJC-05, reinforced & unreinforced. 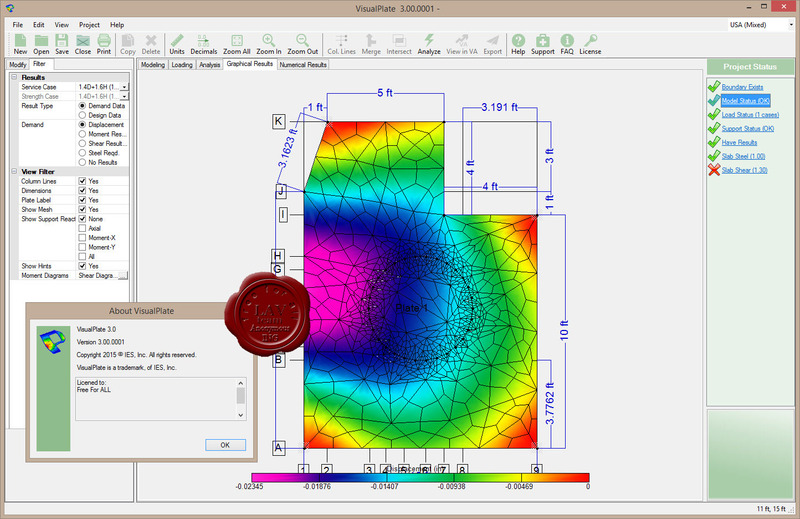 ShapeBuilder is a section properties calculator, stress analysis, shape database customization. Get torsion properties, cracked section properties, concrete section capacities and interaction diagrams. Integrates with VisualAnalysis. More info. Great for unusual projects, and large, complicated models. Three feature and price levels available: Compare Levels. Building-code support is optional, use it for mechanical applications too. Extremely versatile: model just about anything! Reporting is extremely powerful and very flexible (save your own styles). So easy to use, most customers are productive within hours of installing. Over 3000 companies use IES tools: one part-time support person at IES! BIM support: VARevitLink provides two-way integration with Autodesk Revit Structure. Dedicated to foundations, so easier to use than VisualAnalysis for this task. Automated modeling - the FEA model is built and refined automatically. Incorporate the effects of walls and beams in the slab. Over 2500 companies use IES tools: one part-time support person at IES! Mat foundation analysis and design. Complex mat boundaries, including circular and polygonal templates. Generate copies of modeling elements using rectangular or circular patterns. Multiple mat thicknesses or soil properties. Walls, grade beams, columns and pile supports. Support for codes: IBC, ASCE 7, ACI 318. Automated FEA meshing and soil-spring supports. 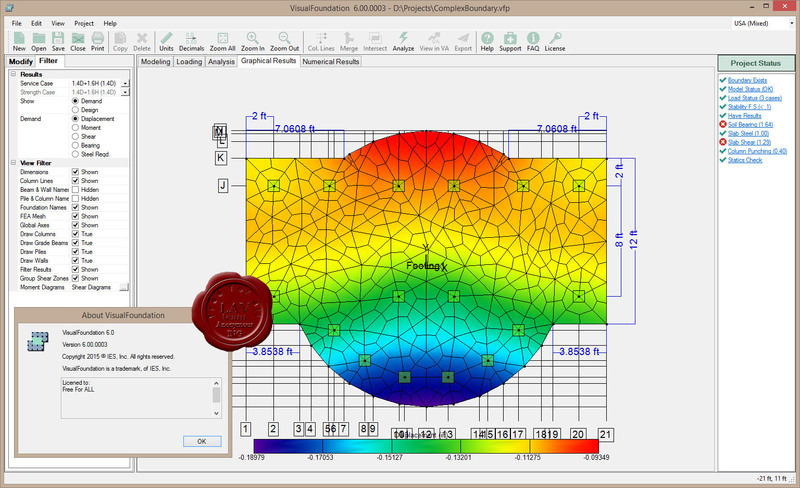 Sophisticated thick-plate finite element formulation. 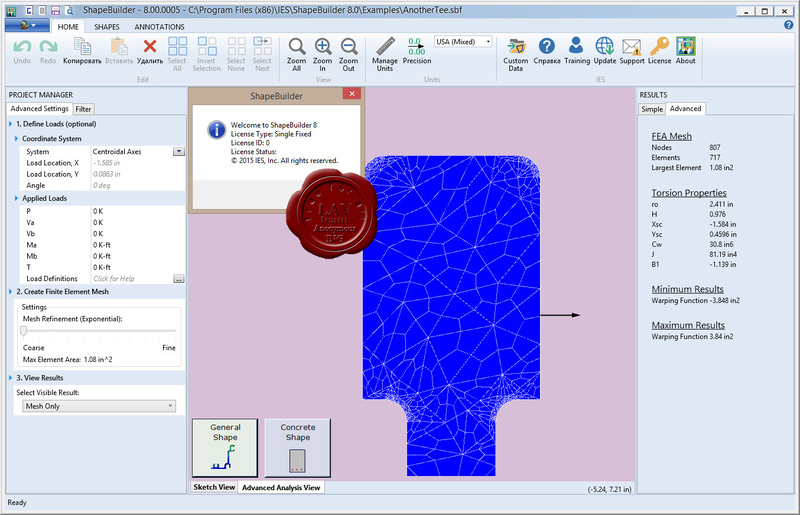 Import & Export DXF files. Import & Export with VisualAnalysis. Improved usability: easy graphics and toolbar commands. 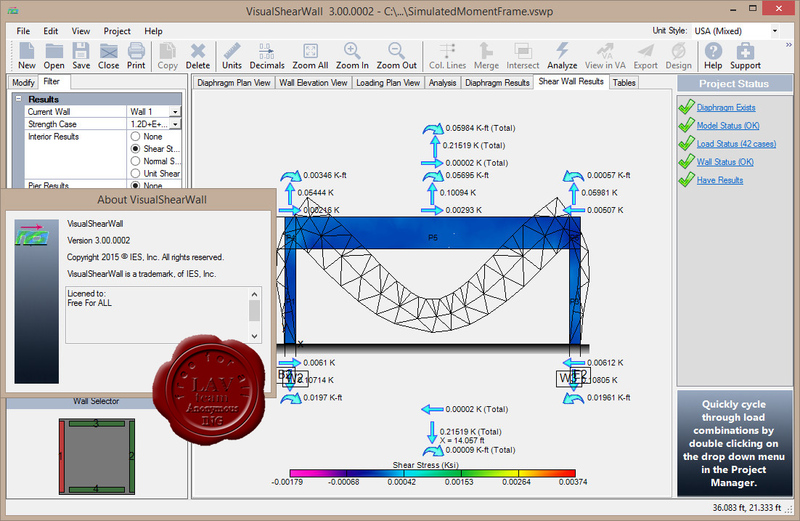 IES, Inc. creates high quality structural design software for engineering and related professionals. Your solution for general analysis, frames, trusses, shear wall systems, foundations, retaining walls, floor systems and more in steel, wood, concrete, aluminum, cold-formed, and masonry. What Will VisualShearWall do for you? Analysis of shear wall systems: rigid and semi-rigid diaphragms. With a program dedicated to this task your job is made easier. Integrates with IES VisualAnalysis. QuickRWall is perhaps the best tool on the market for retaining wall design! It will get you out of the 'black box' and into high-quality wall design in short order. The reports are excellent with full equations and intermediate data readily available for complete checking. QuickRWall is very graphical, extremely easy to use, fast, and robust. This is one of our best-sellers. A standalone tool of masonry components to manage multiple structural components within a single project file. The QuickMasonry "Project Management" tool offers the ability to design a whole series of lintels and walls, for a single building in one project file, following the latest masonry design specifications and offering a host of impressive features. What Will VisualShearWall do for you? Analysis of shear wall systems: rigid and semi-rigid diaphragms. With a program dedicated to this task your job is made easier. Integrates with IES VisualAnalysis. What will VisualPlate do for you? 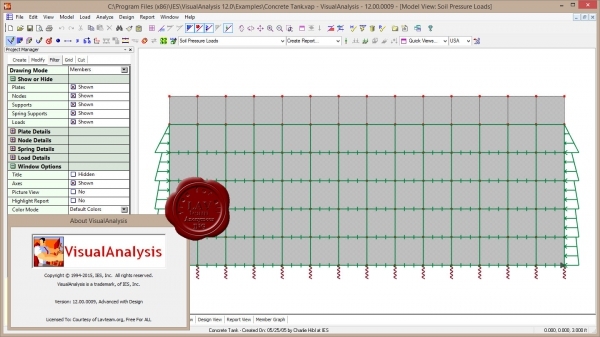 Wall, slab or plate bending analysis and design. With a program dedicated to these tasks, your job is made easier. Integrates with IES VisualAnalysis. New! Improved usability: easy graphics and toolbar commands. Section properties calculator, stress analysis, shape database customization. 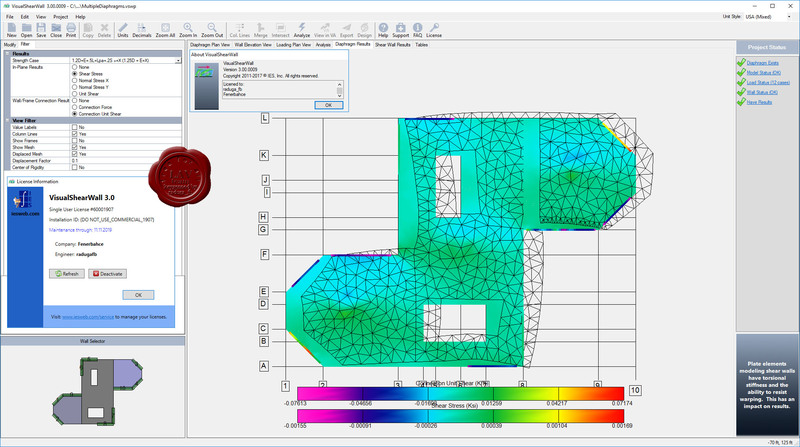 Get torsion properties, cracked section properties, concrete section capacities and interaction diagrams. Integrates with VisualAnalysis. 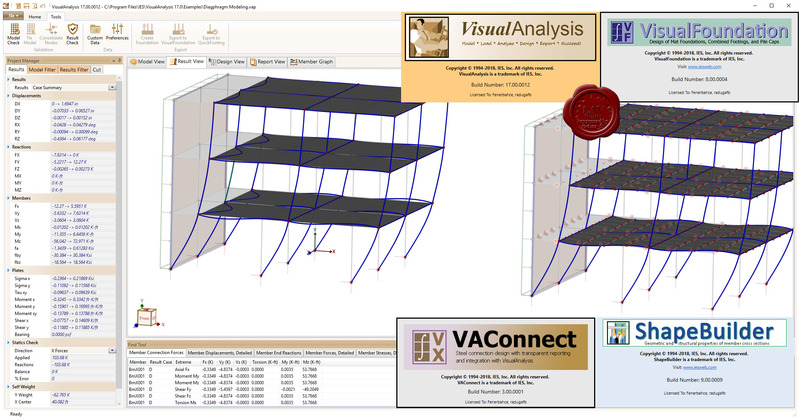 VAConnect is a set of connection-design utilities that integrates with VisualAnalysis Design level or higher. Save the time and hassle of copying loads and geometry from one program to another. Face it, checking many load combinations is a pain, but VAConnect does exactly what is needed using all the loads from VisualAnalysis, while grouping similar connections for consistent, organized design. The tools also run stand-alone for the situations where you just have a quick check to make or a question to answer. Get back to any design in seconds to update a value or print a report. To run the stand-alone tools, you must purchase the product outright or get it as part of the IES Building Suite or IES Total Suite. With IES Transparent Reporting you get either summary reports or details that look and feel like you wrote them out by hand with sketches, equations, code references, and a clear, logical flow. These tools are the opposite of black-box and blind-trust. What will VisualAnalysis do for you? General purpose analysis and design of just about anything.